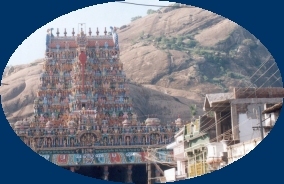 Thiruparamkundram or Paramkundru , a hill near Madurai, in Tamilnadu - South India, is the first and foremost temple of Lord Muruga in India and is the first Aarupadai Veedu as well. Saint poet Nakkerar, in his songs in praise of Lord Senthil Andavar, places Thiruparamkundram in the first place amongst the six battle places ( Arupadaiveedu ) that Lord Muruga has fought to win over evil. The various names of the presiding deity include Subramanya and Subramanya Swamy. Nakeerar, in his Tamil writings compilation called Thirumurugatruppadai, more than 2000 years ago, and saint Poet Arunagirinaathar, who has composed Thirupugazh verses on Murugan, have both sung in great praise of Lord Subramanya of Thiruparamkundram. This place is considered to be the holy spot where Lord Muruga's celestial marriage took place.Saint Poet Nakkeerar composed his great literary work Thirumurugatrupadai in this divine place. The story goes that he was imprisoned in a cellar by a demon and Lord Muruga came to the rescue of the poet Nakkerar, on hearing the songs composed. The marriage took place after Lord Subrahmanya vanquished the arrogant demon Soorapadman in the battle at Tiruchendur. The temple is situated just five kilometers in the South-east direction of Madurai, abutting the main railway line. See below for associated websites and other links on where to stay and details on the tour operators who package Madurai in their itinerary. The temple is located in the northern side of the hill. Before the gopuram, Sundara Pandiya Mandapam and Asthana Mandapam are located. The idols depicting the marriage of Lord Muruga with Deivayanai is gratifying. The sculptors bring the idols to real life with their exquisite carvings. The temple hall houses idols depicting the excellent sculpturing skills include those of Elephants, tigers, tiger hunting etc. Twenty pillars made of stone, each 48 feet in height add a touch of class to this temple. The Rajagopuram and the Kalyana mandapam are just ahead of this hall. On the western side, one can identify the Lakshmi Theertham and on the western side is the Brahma Koopam ( also called Saniyasi Kinaru). Water from the Brahma Koopam is used for the Abhishekam of Lord Subrahmanya Swamy. In front of the Dwajasthambam or the Kodi Maram, one gets the magnificiently carved Nandi, Mayil and the Mouse ( the vehicle of Lord Ganesha). This is a specialty of this Murugan shrine.Going inside, one can see the sannidhis of various Hindu Gods and Hindu Goddesses. 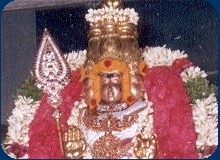 Of special mention is the sannidhi of Saneeswaran without the other eight Grahas. Climbing a flight of six steps called the "Shadashara Padigal" , one reaches the Artha Mandapam. One gets to see the rock carvings of Mahisshasura Mardini, Karpaga Vinayagar, Andarabaranar and Uggirar. There is also a rock carved sannidhi for Lord Vishnu and Goddess Lakshmi. Shiva in the form Sivalingam and Sathiyagireeshwarar sannidhis located here cannot miss the attention of the Muruga Bakthas visiting this Murugan shrine. Sage Narada is believed to have received the blessing of the Lord here. The Moolavar deity is also sculptured from a rock. Abhishekams for the presiding deity is done to the Murugan's Vel only. The main lord of swami malai - affectionately called as Swaminadha - is 6 feet tall with broad shoulders holding sakthi vel and dhandam(staff). Instead of Mayil Vahanam or the peacock vehicle, Elephant is depicted as the vahana (divine vehicle) in front of the lord. This feature is very unique, not available in any other temples of Lord Muruga. IMBIBE THE SPIRIT OF MURUGA BAKTHI (Devotion to Lord Muruga) - IN YOUR KIDS ! Many of those who migrated away from India, be it the early settlers in South Africa or the tech-savvy migrants to US - the first generation who have lord Murugan in their hearts find it difficult to pass on this spiritual shield to their children who grow up in alien lands. Keeping this in mind, Cybervalley Systems has brought out a CD-ROM titled ARUPADAIVEEDU - A MULTIMEDIA ECSTASY that can play on all PCs and select VCD players. It is a multimedia title covering a group of six most sacred temples of Lord Muruga - popularly known as Arupadaiveedu - in south India. Such rare footages produce spiritual ecstasy in one's mind, even if they are viewed repeatedly ! Peace and tranquility are the possible benefits of viewing the CD contents - be it in a group during small functions or alone- in solitude in the background of darkness. For kids- it will be as much fun as watching the cartoons - if only the parents take time to explain the CD contents to their kids with some interest. About 1200 years before, the Pandiya Kings constructed a great part of the temple precincts and temple walls. The Madurai Nayakar King Veerappar, Raja Thirumalai and Queen Mangammal are known to have patronized this temple and generously contributed towards temple maintenance. The stala vriksham for Swamimalai temple is the Amla tree( Nellimaram) . Daily pujas to the deities are performed six times a day (six kalams). Forenoon : Ushat Kalam, Kalasandhi and Uchikala poojas are performed in the and the afternoon poojas commencing from Sayaratchai and Rendam kalam are concluded with Arthajama pooja in the night.